Caraway seeds are used as a spice in breads, especially rye bread. 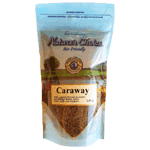 Caraway is also used in desserts, liquors, casseroles, curry and other foods. It is more commonly found in European cuisine. For example, it is commonly used in British caraway seed cake and is also added to sauerkraut. Caraway also has a long tradition of medical uses, primarily for stomach complaints. Import of South Africa.